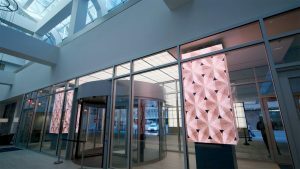 Marriott International has unveiled a host of modern upgrades to its Sheraton Dallas property, including two state-of-the-art digital video columns at the hotel’s entrance. The custom-engineered, four sided LED columns were manufactured by SNA Displays and feature an eye-catching modern digital art piece. The digital displays and art installation were part of a multi-million-dollar renovation to the historic downtown Dallas hotel, a major refresh managed by The Chartres Lodging Group. Other upgrades by the San Francisco hotel investment and advisory firm include improved meeting and event spaces, enhanced and rebranded food and beverage services, and redesigns for most of the hotel’s bathrooms, hallways and guest rooms. Prism Electric is an electrical contractor with offices in Texas and Oklahoma employing skilled managers, estimators, superintendents, tradesmen and support staff. Prism’s experience has grown from the highly complex healthcare industry to include commercial, industrial, institutional and high tech industries. Leftchannel is a content design studio with a global presence. For nearly 20 years, they have specialized in getting people to pay attention in a very noisy world. This entry was posted on Wednesday, April 10th, 2019 at 21:22 @931 and is filed under DailyDOOH Update. You can follow any responses to this entry through the RSS 2.0 feed. You can leave a response, or trackback from your own site.